"Raises max MP by 2, and significantly enhances magic and summon power. Also inflicts good physical damage." White Trinity Mark in the Lotus Forest. "Obtained in Wonderland. A balanced weapon that is easy to handle." 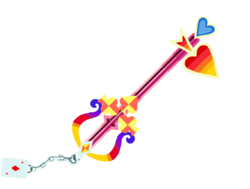 "A Keyblade that restores HP when you block. Its powers negatively affect enemy status." Slay 40 enemies with the Lady Luck. Slay 80 enemies with the Lady Luck. Slay 120 enemies with the Lady Luck. Slay 160 enemies with the Lady Luck. 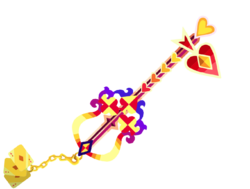 The Lady Luck is a Keychain for Sora's and Player's Keyblade that appears in Kingdom Hearts, Kingdom Hearts Chain of Memories, Kingdom Hearts Re:coded, and Kingdom Hearts χ. In Kingdom Hearts Chain of Memories, the Lady Luck is the signature Attack Card for Wonderland. Lady Luck's design differs depending on its upgrades, most of which are seen in Kingdom Hearts χ. Its general appearance is based on the four suits of playing cards: hearts, clubs, spades and diamonds. The basic Lady Luck has a violet handle and blade with a pink highlight, with a pink diamond at the pommel. Its guard consists of two clubs facing each other, with a pink checkered pattern. The teeth are a dark pink spade with an angled base. The Keychain's links are a bronze color, and the token is an Ace of Clubs. 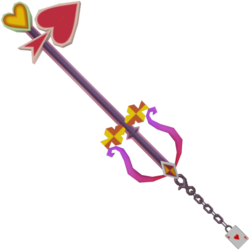 The first upgrade, also seen in Kingdom Hearts, retains the design of the hilt and the blade. The guard's pattern is a yellow and orange-brown checkered pattern, and the pommel is a diamond with a slightly darker version of the same pattern. The rest of the guard is a purple and red horseshoe shape with curled ends. The blade is tipped with a large, orange heart with a thin, red and yellow border. 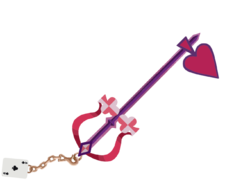 The teeth of the Keyblade are comprised of a large, red spade with an angled base. The Keychain is silver, and its token is an Ace of Hearts. After the second upgrade, the Keyblade's shaft is closer to blue in color. 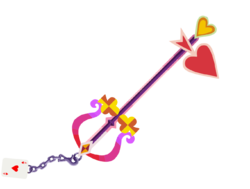 The "crossguard" includes a spade along with the two clubs, and the clubs and spade have a reddish pink and light pink checked pattern, similar to the base Keyblade's. The diamond pommel has the same pattern, along with a blue outline. The rest of the guard is a blue-to-red gradient. The heart at the blade's tip is now red with a blue outline, while the spade at the teeth have a red gradient. The Keychain is a pale gold in color, and its token is a shiny Ace of Diamonds. The third upgrade increases the width of the shaft, and gives it a magenta coloration. The guard has a gradient of blue to red to yellow. The "crossguard" clubs and space are yellow and orange, while the pommel now features a similarly-colored diamond with a silver outline. The tip of the blade features a blue heart, while the spade at the teeth bears a red-to-yellow gradient with a pale yellow outline. The Keychain is silver, and the token is a bright white Ace of Diamonds. The fourth upgrade features the most ornate design of the series. While the shaft remains unchanged, the guard has a filigree that extends behind the guard, and its colors go from blue to purple to red to yellow, and then back to red. The clubs and spade have a red and yellow pattern, as does the pommel diamond, which now bears a blue outline. The blade now features a series of hearts along the shaft, going from red to orange to yellow. The heart at the tip is golden with a red outline, while the spade at the teeth has a red gradient, along with an inset golden diamond. The Keychain's links are golden, with the token now three golden Aces of Diamonds. 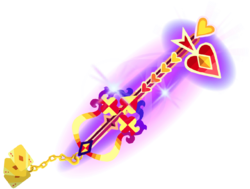 The fifth upgrade cloaks the Keyblade in a violet aura. The Keyblade's English name is derived from the goddess of fortune in Greco-Roman mythology; Tyche in Greece, and Fortuna in Rome, who was also known as "Lady Luck". Lady Luck is also the name of a dressphere in Final Fantasy X-2. Its Japanese name is a pun on the "Trump Card", a card that is used as a backup move to guarantee victory. Early beta of the Lady Luck in Kingdom Hearts χ. This page was last edited on 5 April 2019, at 16:57.